This week’s High-Yield Trade of the Week is with Kimberly-Clark (KMB), a Dividend Champion whose brand name products include Kleenex, Huggies, Pull-Ups, Little Swimmers, Depend, Cottenelle, Kotex, Scott, VIVA and more. 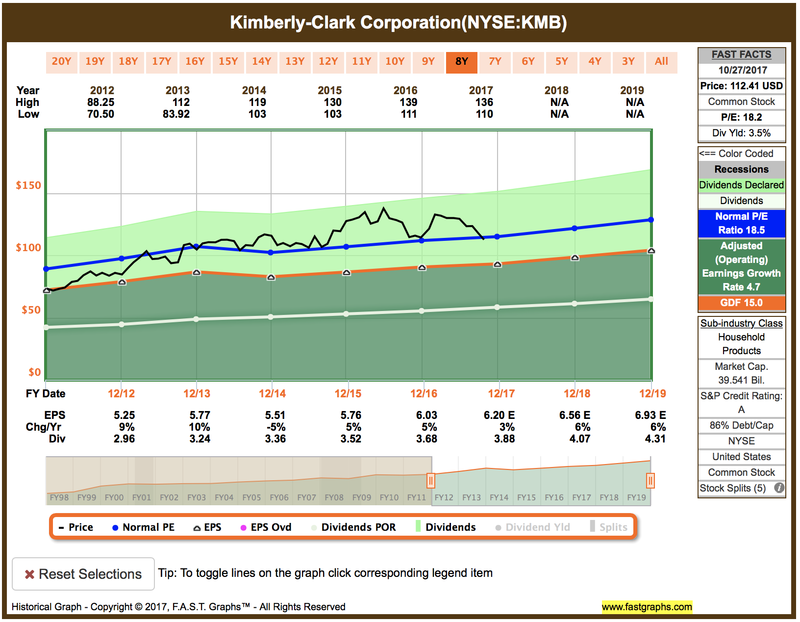 How safe is Kimberly-Clark’s dividend? We ran the stock through Simply Safe Dividends, and as we go to press, its Dividend Safety Score is 97. This is great news for conservative investors looking for safe, growing dividend income they can depend on over the long haul. But what about today? What if you’re in or nearing retirement and you need safe, high income right now? Even with the Kimberly-Clark’s dividend yield climbing to a 52-week high of 3.4% (and well above its 5-year average of 3.1%), a million-dollar portfolio at that yield would pay you just $34,000 a year. 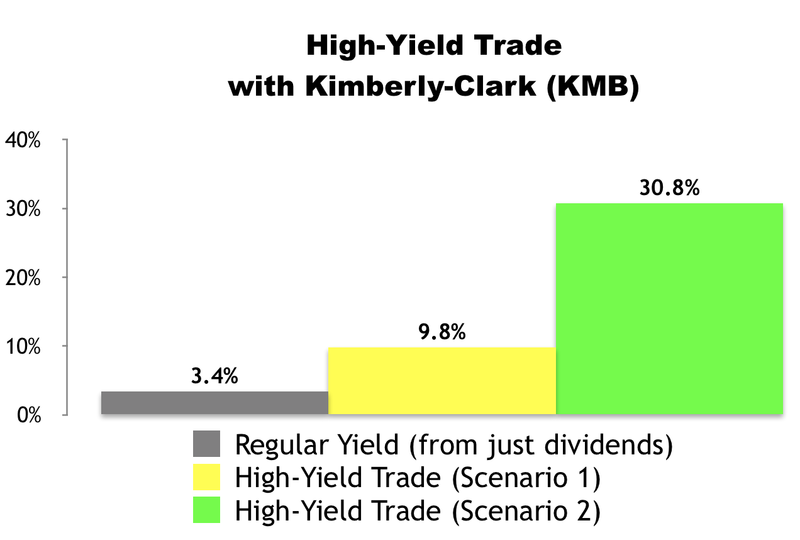 But what if you could make a high-yield trade right now with Kimberly-Clark shares that boosts your income significantly — generating an annualized yield in the double-digits? And what if this trade was designed to be safer than buying the stock the “traditional” way? 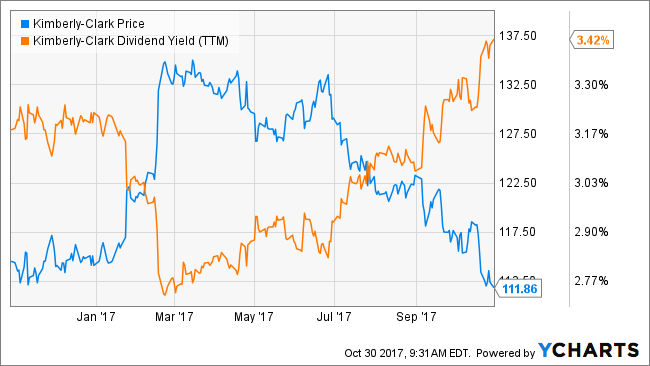 In fact, I just made one of these high-yield trades with Kimberly-Clark this morning… and I’m generating a 9.8% to 30.8% annualized yield. Fundamentally, thanks to a pro-longed pullback, it now appears to be trading in fair value territory. There’s a lot going on in the FAST Graph below, but all you really need to know is that when the stock’s price (black line) is below its normal P/E (blue line) in multiple time frames, shares look relatively cheap. When the black line is on the blue line, as it is now, it appears to be fairly valued. Note: I’m using the 8-year normal P/E in the chart below. As we go to press, KMB is selling for around $112.04 per share and the December 15 $115 calls are going for about $1.38 per share. By selling call options, we would be giving the buyer of the option the right, but not the obligation, to purchase our 100 shares at $115 per share (the “strike” price) anytime before December 15 (the contract “expiration” date). In exchange for that opportunity, the buyer of the option would be paying us $1.38 per share (the “premium”) per option. If KMB stays under $115 by December 15, our options contract would expire and we’d get to keep our 100 shares. In the process, we’d receive $138 in premium ($1.38 x 100 shares). Excluding commissions, if “Scenario 1″ plays out, we’d receive a 1.2% yield for selling the covered call ($1.38 / $112.04) in 46 days. That works out to a 9.8% annualized yield. If KMB climbs over $115 by December 15, our 100 shares will get sold (“called away”) at $115 per share. In “Scenario 2” — like “Scenario 1” — we’d collect an instant $138 in premium ($1.38 x 100 shares) when the trade opens. We’d then collect another $296 in capital gains ($2.96 x 100) when the trade closes because we’d be buying 100 shares at $112.05 and selling them at $115. In this scenario, excluding any commissions, we’d be looking at a $434 profit. From a percentage standpoint, this scenario would deliver an instant 1.2% yield for selling the covered calls ($1.38 / $112.04) and a 2.6% return from capital gains ($2.96 / $112.04). At the end of the day, we’d be looking at a 3.9% total return in 46 days, which works out to a 30.8% annualized yield from KMB. We’d place a “Buy-Write” options order with a Net Debit price of as close to $110.66 ($112.04 – $1.38) as we can get — the lower the better. Options contracts work in 100-share blocks, so we’d have to buy at least 100 shares of Kimberly-Clark (KMB) for this trade. For every 100 shares we’d buy, we’d “Sell to Open” one options contract using a limit order. Accounting for the $138 in premium we’d collect for selling the contract, that would require a minimum investment of $11,066.